Location, location location! 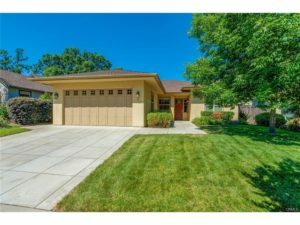 Beautiful Shastan home just steps away from popular Bidwell Park. 4 bedrooms and 2 baths all on one level. Open and spacious floorplan. Custom designer paint, high ceilings, skylights and transom windows let the light shine in. Tiled foyer. The hall, large living, dining and family rooms have hardwood laminate flooring. Built in speakers in the living room provide an excellent entertainment space. Gas fireplace with wood mantel. The kitchen is open to the family room with an eating bar and breakfast nook overlooking a manicured backyard. The kitchen has raised panel, cherry cabinets with granite countertops, stainless steel GE Profile appliances. Large master suite with walk in closet, soaking tub, separate tiled shower with a dual sink vanity. There is a large backyard with lawn and flowering shrubs. This home is well cared for and shows great. Excellent neighborhood close to parks, schools, shopping and more. This one won’t last long!